American Flags and Colorado Flags to fly at half-staff Friday, June 1st in the state of Colorado in honor of Jeremy Bitner. Englewood Police Officer Jeremy Bitner was fatally injured while on duty during a traffic stop on May 28, 2012. His funeral service will be held Friday, June 1, 2012, followed by interment at Fort Logan National Cemetery. Officer Bitner was a veteran of the U.S. Army. He became an officer with the Englewood Police Department in 2004. American Flags and Kansas Flags to fly at half-staff Wednesday, June 6th in the state of Kansas in honor of Private First Class Cale Clyde Miller. Private First Class Cale Clyde Miller died of wounds suffered from enemy action on Thursday, May 24th while serving in Afghanistan. Private First Class Miller was a member of the 4th Battalion, 23rd Infantry Regiment, 2nd Stryker Brigade Combat Team, 2nd Infantry Division based out of Joint Base Lewis-McChord, Washington. All Star Flags, an authorized Annin Dealer, is proud to be a part of the Team Behind the Team in support of fundraising for the U.S. Olympic Team. The U.S. Olympic Committee (USOC), a non-profit organization, has created the “Raise Our Flag” campaign to support the athletes through corporate sponsorships and donations. The USOC has asked Annin Flagmakers to provide the flag that will be made from donated stitches and will be carried by American athletes at the London Games’ opening ceremony. The flag is being symbolically created in Annin’s Verona, New Jersey plant through July 12, 2012. For more information about purchasing a stitch or tracking the tally of stitches, go to https://raiseourflag.teamusa.org/Content/index.aspx#!home today. All Star Flags purchased stitch 8,769 on behalf of our dedicated employees and stitch 8,770 in honor of our loyal customers who fly their American Flags year round! American Flags and Illinois Flags to fly at half-staff Tuesday, May 29th through Wednesday, May 30th in the state of Illinois in honor of US Army Specialist Samuel Watts. Happy Memorial Day from All Star Flags. Remember to honor those men and women who have bravely served our Country. American flags fly at half-staff on Memorial Day until noon and then are raised to full-staff for the balance of the day. American Flags and Virginia Flags to fly at half-staff Saturday, May 26th at the Capitol complex in Virginia in honor of Former US Representative William C. Wampler, Sr. Flags are also authorized for display at half-staff in the County of Washington. 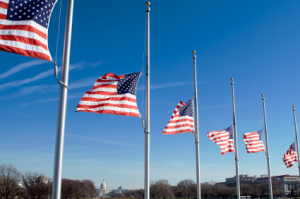 American Flags and Virginia Flags to fly at half-staff Friday, May 25th at the Capitol complex in Virginia in honor of US Army Pfc Richard L. McNulty III. Flags are also authorized for display at half-staff in the County of Chesterfield. American Flags and Colorado Flags to fly at half-staff Thursday, May 24th in the state of Colorado in honor of 1st Lt. Alejo Thompson. 1st Lt. Alejo R. Thompson died on May 11, 2012, in Parwan Province, Afghanistan, in support of Operation Enduring Freedom. According to Defense Department reports, Thompson died of injuries sustained when his dismounted patrol received small arms fire. Thompson was assigned to A Company, 1st Battalion, 12th Infantry Regiment, 4th Infantry Division, Fort Carson. American Flags and Illinois Flags to fly at half-staff Sunday, May 27th through Tuesday, May 29th in the state of Illinois in honor of US Air Force Captain George McDonald. Captain McDonald was declared missing in action at age 24 while supporting combat operations during the Vietnam Era; a full military memorial service will be held at Arlington National Cemetery on Tuesday, May 29, 2012. American Flags and Maine Flags to fly at half-staff Thursday, May 24th in the town of Montville, ME in honor of Sergeant First Class Mark Coleman. Sergeant First Class Mark Coleman, a Maine State Trooper, and a traditional Guardsman with the Massachusetts ARNG died May 17 from the affects of a Traumatic Brain Injury & Terminal Disease. SFC Mark Robert Coleman served in support of Operation Enduring Freedom and deployed to Guantanamo Bay Cuba.